One of the dilemmas every prepper faces is how to derive the most value out of their food storage budget. None of us want waste and none of us wants stuff that tastes bad. Of course the easiest and most economical thing to do is to stock up on the proverbial beans and rice, adding supplementation with oatmeal, powdered milk and a variety of condiments. With these few items, delicious meals can be prepared simply and there will be adequate nutrition to sustain oneself especially if garden fresh fruit and vegetables are also available. In my own case, I have over 200 pounds of various beans and legumes and over 300 pounds of rice. I also have lots of chicken and beef bouillon, salt, pepper, chili powder and onion powder for flavorings. These items were inexpensive enough that I will have plenty to share with my less fortunate neighbors who may not have had the money to stock up on food but have skills that I can barter with if the SHTF. Buying in bulk simply makes good sense when getting started. There is no real research involved – you just go to the store and start making purchases as budget allows. The cost is cheap (I know I keep saying that but it is true) and with some relatively inexpensive Mylar bags, oxygen absorbers and buckets, bulk foods are easy to package and store for the long term. Bulk foods do take space, however, and they should be kept cool. Space wise, though, when first getting started you can eliminate the buckets and store the packets of food in nooks and crannies throughout your home or apartment. Heck, even under the bed is a good place to store bulk foods. So bottom line? When first getting started get the basics in bulk foods and use some of your start-up budget for a good water filter, some water purification tablets and possibly some bottled water if you do not want to make up you own bottles of water. As you study prepping and survival sites on the web, you are going to be bombarded by ads from freeze-dried food suppliers as well as from bloggers such as myself who have products to recommend. This is not necessarily a bad thing since there are a lot of really, really good freeze dried products out there. Furthermore, there are not only freeze dried meals, but also standalone products such a meats, veggies, fruits and my personal favorite, shredded cheese. Using myself as an example, I own a variety of these products from a variety of vendors. I like to cook so I have migrated toward the individual components although I do keep some freeze dried meals on hand as well. Some are quite good. One of my favorites is the Legacy Foods “Beans & Rice Enchilada” meal. Now to be honest, it looks pretty bad before it is re-hydrated. This is pretty typical. But after adding boiling water and letting it sit for awhile, well, I don’t think I could have made it tastier had I made it from scratch. Which gets me back to my original question. What is the value proposition when comparing bulk foods of freeze-dried foods? (And by value proposition, I mean the benefits of one versus the other given the difference in cost. ) In my mind, a reasonable person would use the following factors to compare the benefits of one type of food to another. These are: Shelf Life, Cost, Storage, Convenience and Taste. I have my own opinions, of course, but I thought it would be interesting to get the opinion of a vendor who lives and breaths this stuff. I chose Buy Emergency Foods (and Legacy Foods) for a couple of reasons. First of all, I like their food (such as the beans and rice enchiladas I mentioned above) but also I have gotten to know the CEO and feel that he is a sincere and credible guy. With the assistance of one of his colleagues, Lee Flynn, (who is also a freelance writer an expert in emergency food preparedness and food storage) he provided me with the following response to my quest for an industry opinion on the value and benefit of bulk versus freeze dried foods. Paper or plastic, gas or electric, debit or credit—life is full of choices. And choosing between bulk foods or freeze-dried meals—to ensure that you get the best overall value while meeting the long term food storage needs of your family—can be daunting. In the interest of making the decision process a little easier, here’s a look at some of the pros and cons of both bulk and freeze dried foods. When choosing which foods to include in your emergency storage, a major deciding factor should be shelf life. If your overall goal is to build a long term emergency supply, freeze dried foods should definitely be on your list, as many freeze dried meals are made to last up to 25 years or more when stored at room temperature, and still retain their original flavor and nutritional value. The shelf life of bulk food items will be subject to temperature and humidity fluctuations in the storage area and are limited to only a few years at best. One big advantage of buying in bulk is that it allows you to get your core items fairly inexpensively and build up a good supply quickly—even when on a limited budget. 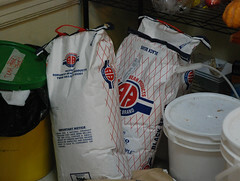 Bulk foods are also readily available now at all large grocery stores. Freeze dried meals are typically more expensive upfront, but they can save you money in the long run by not having to replace or replenish them as often due to their longer shelf life. By contrast, shorter dated bulk food items will often need to be used and replaced before a need or emergency actually arises. However, bulk foods nearing the end of their shelf life can be more easily used in your everyday cooking than freeze dried—without having to make dietary changes. Another cost benefit of bulk food ingredients is the ability to stretch items over many different meals. Freeze dried meals, which come in pre-portioned packaging, are only good for one use. Storing bulk foods can be difficult, as they typically require large containers that take up more storage room. In addition, bulk foods require additional measures to keep pests away and protect them from the elements. Freeze dried meals are tightly sealed, compact, and easy to stash away in almost any environment or climate, making them far easier to store, organize, and transport than bulk foods. Freeze dried meals are by far the most convenient food storage option available. Most only require hot water and minimal cooking time. In contrast, bulk foods require more preparation, cooking, measuring, and even cooking pans and utensils. If you find yourself in a position where you must leave your home—especially in a hurry—you’ll find that freeze dried meals are much easier to transport and prepare than bulk foods which may weigh you down and make survival more challenging. In the past, many people preferred the more home-cooked flavor of bulk food meals over freeze dried meals. And bulk foods do tend to make it easier to stick to a diet that is more familiar to you or your family. In addition, with bulk foods you can prepare meals that are closer to what you enjoy without any unnecessary ingredients that may alter taste or trigger sensitivities that freeze dried meals may include. This is especially helpful for those with special diets or allergies. However, it should be noted that when it comes to taste, freeze dried foods have come a long way in terms of the quality of ingredients, and the ability to retain both taste and texture despite years of storage. This makes freeze dried meals an excellent choice for satisfying the varied food and taste preferences of a family in regard to age, special diets, and the nutritional needs of each family member. In addition, storing complete and “ready to eat” meals that can be quickly prepared—as opposed to the bulk ingredients needed to make all your meals from scratch—gives you added peace of mind in knowing that you and your family are prepared to face any emergency. And it’s hard to put a value on that. I still endorse a methodical, step by step approach to storing foods for the long term. For some this will mean picking up a few extra bags or cans of food with each trip to the grocery. For others it will mean learning to can the bounty from their gardens, orchards or fishing and hunting expeditions. And yet for others it will be expanding their stored foods to include prepackaged meals and other freeze dried items. Whatever method you choose, keep in mind proper storage procedures (see the The Six Enemies of Food Storage) and, if buying in bulk, learn how to cook those bulk foods now, preferably outdoors on an open fire as well as in your kitchen. When all is said and done, it may not be important whether you stocked up on bulk or pre-packaged foods. Instead, the importance lies in having have done something to insure you will have food if things go awry down the road. Bargain Bin: The Survival Woman picks for today include items to enhance your food storage. 60 – 300cc Oxygen Absorbers: This is one area where you want to make sure you are getting a quality product. Currently, a pack of 60 (in three 20 unit packs) is about $15 with free shipping. 20 Gallon Size Mylar Bags : Another product I have purchase from OakTea through their Amazon store. Mylar bags & Oxygen Absorbers: Sometimes it is more economical to purchase the oxygen absorbers and Mylar bags as a “kit”. Remington Hair Straightening Flat Iron: Perfect for sealing those Mylar bags. This one is less than $17 with free shipping. For this purpose, there is simply no reason to spend more than that. 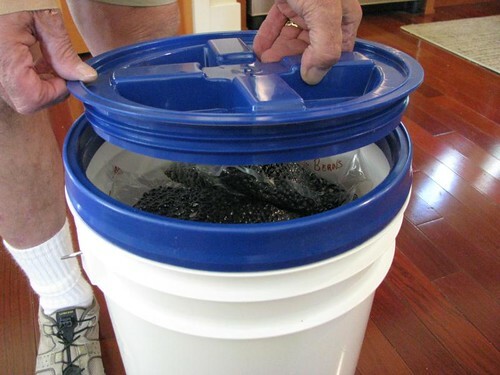 6-gallon Buckets with Gama Air-tight Lids : I purchased 20 of these and am using them to store gallon sized packages of food in either Mylar or Food Saver bags. With oxygen absorbers, of course. Gamma Seal Lid- 6 Pack : If you can get your hands on some free buckets, this is the way to go. Food Saver Jar Sealer: For $10, I can use this gadget to vacuum seal anything and everything in a wide mouth mason jar. Lodge 12-Inch Pre-Seasoned Skillet : The basic standby for all types of cooking, inside or out. Lodge Set of 2 Pan Scrapers: A must have to go with that skillet. Lodge Logic 4-Quart Cast-Iron Camp Dutch Oven : Love it love it love it. This is the perfect size for all types of things: baked beans, stews, and my favorite, peach cobbler. Be sure to shop the Emergency Essentials Monthly Sales for some great deals – typically 20% to 30% off. But not to be left out, there are veggies too. The deluxe supply of Freeze Dried Vegetables includes 18 #10 tins of the following veggies in various quantities: Broccoli, Cauliflower, Sweet Corn , Green Beans, Green Peppers, Green Peas, Mushrooms, Potato Dices, Spinach, and White Onions. CLICK HERE to follow Survival Woman on Twitter. Shelf Reliance Virtual Party: Are you a fan of Shelf Reliance and Thrive products? Backdoor Survival is hosting a virtual, online Shelf Reliance party with discounted party prices and some special packages not normally found at the Shelf Reliance site. As a matter of fact, all of the packages you see available at Costco.com are available at my party and and better prices too! If nothing else, look into some Thrive shredded cheese – my absolute favorite! If there’s a local LDS cannery near you then try to get an appointment to buy bulk foods there… it’s by far the least expensive resource for most basic bulk foods. Of course, there are some bulk foods that you simply much buy elsewhere (such as online) including powdered cheese, eggs, and so on. To add to that, you do not need to be LDS (Mormon) to shop at an LDS cannery. Not only that, but the people there will be some of the nicest people you will ever meet. Okay, I get the advertiser thingy when you have a popular blog. Actually, Legacy Foods are now certified 100% GMO Free. I don’t consider it a matter of an “either/or” choice between freeze dried, bulk,and canned goods food, but rather as an opportunity for combinations. In other words, adding bulk rice or noodles or beans to a freeze dried entree or canned soup will extend the good flavors of the entree with the added protein of bulk grains and beans. Same with canned goods – one can of Hormel chili with added beans and freeze dried TVP served with bulk grain fresh bread will make many delicious hot sandwiches. Add some fresh sprouts or micro/mini greens and your variety is limited only by your imagination. Serve with a powdered fruit drink mix and finish off with hard candy or pie iron goodies and your grandkids may not even notice they are in the middle of disaster (aside from the stench of the bodies piling up out in the larger world). And don’t forget vitamins/supplements.